Anchor Steam® Beer owes its deep amber color, thick, creamy head, and rich, distinctive flavor to a historic brewing process like none other. It is a process that combines deep respect for craft brewing tradition with many decades of evolution to arrive at a unique approach: a blend of pale and caramel malts, fermentation with lager yeast at warmer ale temperatures in shallow open-air fermenters, and gentle carbonation in our cellars through an all-natural process called kräusening. Anchor Steam® Beer derives its unusual name from the 19th century when “steam” was a nickname for beer brewed on the West Coast of America under primitive conditions and without ice. While the origin of the name remains shrouded in mystery, it likely relates to the original practice of fermenting the beer on San Francisco’s rooftops in a cool climate. In lieu of ice, the foggy night air naturally cooled the fermenting beer, creating steam off the warm open pans. Once a nickname for any Californian or West Coast beer brewed under these conditions, today the name “steam” is a trademark of Anchor Brewing and applies only to the singular process and taste of our flagship brand – San Francisco’s original Anchor Steam® Beer. 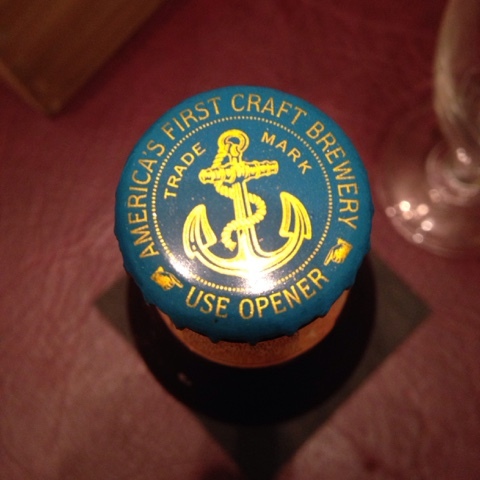 The classic of American brewing tradition since 1896.